Kathy Allen is the General Manager of TV20 and has worked for the television station since 1987. She is responsible for the station's operations. 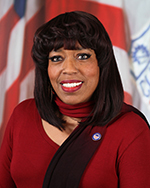 Appointed General Manager by current Mayor Frank G. Jackson, Allen has worked with the administrations of former mayors George Voinovich, Michael R. White and Jane Campbell during her 21 years with the City of Cleveland. Allen is passionate about her career with TV20 and about following the leadership of Mayor Frank G. Jackson. She states that her mission is “to educate the citizens of Cleveland about what’s happening in Cleveland through television”. Allen graduated from Erieview Catholic High School and attended Cleveland State University. She is a proud member of the Word Church. She loves life and she’s a single parent of twin boys, Jeremy and Jordan, who are her pride and joy.